This is a quandary that has haunted me for years. Years, I tell you. I think the quick and easy answer is that you develop a witty rapport with the waitress while she’s serving you, and she’s smiling and laughing and maybe touching your shoulder, and so it’s only natural that you slip her your number at the end of the meal and tell her that you’ll make her the best chocolate peanut butter pudding pie, way better than this restaurant’s desserts, should she ever call you. But we all know that’s never going to happen. Plus, not all waitresses are your waitress. That is, you may want to ask out a different waitress, not the one that’s serving you. You’re selecting things off the menu–why not select a woman to date as well! All you have is looks and general attentiveness to her patrons to go on, but that’s a decent start. Better than meeting a girl at a club and sizing her up by the length of her skirt and whether or not she can hear you over the din. When the waitress is doing nothing, get up to go to the bathroom. 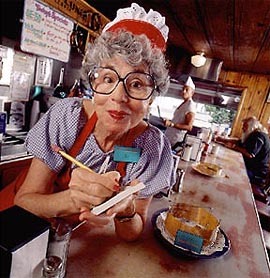 Instead of going to the bathroom, sidle up to the waitress and get her attention. She looks over to your friends, then realizes–the hilarity–that you’re the one in the pink tie. She takes your tie in her hand, pulls you towards her, and makes out with you on the spot. So that’s the plan. Foolproof, right? You avoid awkwardness if she has a boyfriend, and if she doesn’t, she thinks you’re clever and bold. But there’s a problem. The problem is that you’ve taken away the greatest and least awkward excuse not to give someone your number: I have a boyfriend. You have to give her that chance after she knows who’s actually asking for her number, not before. Why am I thinking about this? Again, I’m intentionally single and I want to remain that way. But there was a super cute and kind of alternative-looking waitress at Pueblo Solis tonight. More than cute. She was a hot hipster. Hipster is on my list of “must kiss” people (also on the list: every race except for white and Asian, a significantly older woman, a lesbian [current or former], Amy Adams, a nurse [during an appointment], and a beekeeper). Of course, I did nothing, because I have no idea what to do and I’m not all that bold. I do know that you can’t have a friend talk to the waitress in question. Doesn’t work that way. You also can’t just write your number on a receipt. I’ve been a waiter, and you may not even know who wrote the number. Some sort of rapport or flirtation is necessary. Is there a secret formula that I’m missing? Tell me, ladies and waitresses of the world: What is the right way to ask out your waitress? This entry was posted on Tuesday, January 26th, 2010 at 11:54 pm	and is filed under guy talk and tagged with guy talk. You can follow any responses to this entry through the RSS 2.0 feed. OH my goodness! That pink tie line… it just might work… well minus the smooching afterwords 😉 It’s a bit slower then that. You think so? At the time I thought it was a good idea, but I still think you have to give her the benefit of using the boyfriend excuse. She has a chance to use the boyfriend excuse. It’s right before she looks over at the table to see which guy is checking her out. Yeah, but there’s no one at that table checking her out. You’re the guy. Right there between step 3 and 4. If she’s attached, it shouldn’t matter who’s interested, unless she’s looking to trade up. Nonetheless, I’m greatly amused by your comment. Thanks for dropping by! Jamey, have some balls and ask the girl out. Do the pink tie thing. It’s cute. And if she does have a boyfriend, she’ll tell you. You can totally do this. I have faith in you. I waited tables during college, and only one customer ever asked me out. However, I probably went on dates with about a dozen fellow waiters, a bartender, a busboy, one of our DJ’s, and a drummer in one of the bands that played in our lounge. I assure you this sounds way more slutty than it really was. Anyway, I would have been better off skipping most of the dates with coworkers, especially the drummer. The customer was one of the few educated guys with a decent career who asked me out during that period. So I’m guessing that for many waitresses, it would probably be a nice change to have a handsome, funny young writer in a tie make a request for a date, so long as he was polite and respectful. However, beware! Young women in their twenties, and sometimes into their thirties, often think that when a guy says he doesn’t want anything serious, he’s challenging her to be the one who changes his mind. Please be kind, to them and yourself. Hmmm…I thought young women in their twenties who hear that a guy doesn’t want anything serious think, “The handsome writer in the pink tie just wants to *#$& me and be done with me.” Am I wrong? Nope, not wrong. Definitely exactly what we think. Cara–Thanks for sharing about your varied dating experiences while working as a waitress :). I waited tables for a few summers and got to see the free-for-all that is inter-restaurant dating. Also, great point about women interpreting my offer as a challenge. That would be something to add to my greatest pet peeve about women–reading into what I say instead of just believing what I say. I might let it slide if she were Amy Adams. As a waitress who received many a phone number, make sure she isn’t busy when you do the tie thing, which is brilliant. (guys look great in pink) Also a nice approach, leave an enourmous tip WITH your phone number. Write a note that you were the one with the pink tie. She’ll remember you. Trust me. It won’t seem like you are trying to buy her. At all. And Amy Adams is about to have a baby. Thought you’d want to know. PS–work on the significantly older woman now. You only have about another 10 years before that category becomes somebody’s grandma. This is hilarious! I have to agree with comments already posted: The tie idea is brilliant and you definitely need to get your game on and find an older woman to make out with sooner rather than later. Great post! Today’s grandmothers are yesterday’s moms. If what you’re interested in is the age difference, then act now, as every day older women are moving on. But if “Older woman” is not a moving target, say it’s always 90, then wait until you get closer to 90. LOL! These comments make me laugh and they come with great advices. 1-Be observant. Instead of fantasizing about her lips, your lips, and the make out session, look at what she is wearing (to make sure she is a waitress there) and how she looks that day. 2-Compliment on her hair, a particular facial feature, shoes, etc. 3-Have small talks when she comes by to ask if you need anything else and bringing you drinks and food. 4-Ask her what her schedule is like for the week and say that you would love to take her out for dinner/coffee/whatever if you are not too busy. Do this if she doesn’t have a boyfriend. Move on to the next waitress if she does have one or an imaginary one. If you want cougars, you can find some at Brick House. Last time I was there, there was a table of them with low cut shirts and high heels. Just don’t look for them in pitch dark. You can end up making out with a dude. I think you two are missing the point 🙂 (but well played, Trev). I don’t know what it is about waitresses, but there’s something wonderful about them. Which Wasabi waitress? Was I there with you for lunch that one day? If we are talking about “that” one (the Asian one), I didn’t even know you were remotely contemplating asking her out. I must have missed the boat on that one. There was a hot Asian woman within a 20-yard radius and you thought I didn’t want to ask her out?! My thoughts exactly — any waitress at (fill in the blank sushi place) will be hot according to Jamey, you know, what with his whole Asian addiction (I’m trying to be nice and not call it a fetish). Two, the waitress last night was standing right behind you, so I couldn’t overtly tell you. She would have heard or seen you looking at her. So you’re saying wait for a lull in work. I like that. Before or after the meal? I’d say after, regardless of whether or not she’s your waitress. I was wondering if I was there that day as well. I think Jamey’s been contemplating a lot of things with that waitress from the moment he first laid eyes on her. Trev is right. And yes, both of you were there. I was actually wearing an orange tie that day. I can’t remember if the hot waitress was actually serving us, but I think she was. Man, you really need to grow some balls. Do any of the single moms on this message board (I know you all are out there) have an extra pair to throw Jamey’s way? I could not agree with you more. This goes along with my “put your balls on the table” mantra. Unless it’s a restaurant that I frequent. Like Wasabi. But there’s no excuse at Pueblo Solis. Jamey — wtf? Why did you not bring this up at the dinner table? Was it to avoid being mocked? IF so, that doesn’t make any sense, b/c obviously mockery was inevitable as you knew you were going to blog about it. Also, you had the ultimate ace in the whole as there were two women at the dinner table last night, so you could have preyed on them for advice/assistance last night while in the moment. PLUS YOU HAD THE BEST PICK UP LINE EVER LAST NIGHT. What with you having saved several peoples lives by donating blood. My advise — go the direct route and just ask the waitress out during a lull in her work. The more imporant question: do you wait until after the meal is over? There’s the whole you have to interact with her to get food and pay as well as your friends do, which could be awkward if she stupidly refuses to go out/ make out with you. T-Mac thinks “you’d have better luck with the dudes dressed as old women.” Well, if you put your balls on the table like that then yeah, he might be right. That move might attract “women” like them. I’ve worked as a waitress and other food service jobs (bakery stuff, taking orders at a pizza place), and I honestly hated for guys to hit on me while I’m at work. It was also really awkward for me because I felt obligated to be nice to the guy, but I think the guys tended to think that since I was being “nice”, it meant I was interested in him. I’m not saying you’ll never succeed with hitting on a waitress while she’s at work, but there’s a 95% chance you’ll come off as a desperate creep. And, if the waitress is anything like me or other girls I’ve worked with, the waitress will tell her co-workers about you and what a creep you are and they’ll have a good laugh. Hey, I appreciate the insider scoop from a former waitress (I think I noted on the comments above that I worked as a waiter for a few summers and was flattered to see a few numbers left on the table, but I never knew who they were from). I’m not so much interested in hitting on a waitress. I don’t got to restaurants to really even talk to the waiter/waitress at all (I’m polite, and I tip well, but I’m there to talk with my friends/date, not the server). Um, why is a beekeeper on your must kiss list? Nothing against beekeepers, of course. Why wouldn’t I want to go on a date with a beekeeper? HAHA, I actually have no idea what to say to that. Yeah right there is no way obviously that’s happening even if she wasn’t your waitress and that waitress just randomly came up to you and chatting with you with slight flirting. You can tell if she’s like that with everyone as in just being nice or if she’s particularly singling you out. It’s nearly impossible to actually go out with the waitress beyond her work and it’s totally awkward to ask her if she’s single at her work. The only way you could ask a waitress out is if say it’s a neighborhood restaurant where you visit frequently, live in the area, she the waitress on her day’s off hangs out at the local neighborhood bars nearby and you also happen to hang out at the same bar and run into each other then its game on and you could hit on her without the awkwardness. You bring up a good point–if you can create a scenario when you will run into the waitress later outside of the restaurant without being creepy or awkward, you have a good chance. I’m not sure what the smoothest way to pull that off would be, though. Jamey, I can only offer a story of how to pick up a waiter – not personal experience so much as what happened to a co-worker.